How does Acer's business-aimed laptop shape up? Acer's laptop range covers all sectors of the market, with its Extensa brand comprising its entry-level business systems. The Acer Extensa 5230E-581G16Mn (£392 inc. VAT) is a 15.4-inch machine, which manages to combine effective performance with strong mobility. 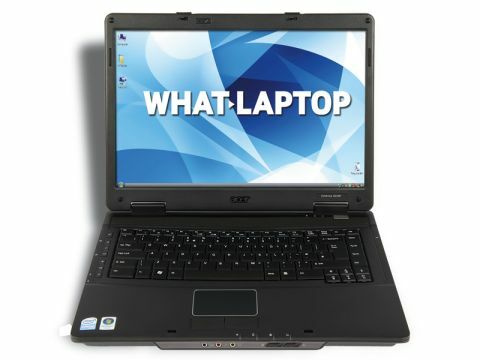 As with many laptops of this type, a matt-finish TFT screen is used. This eliminates reflections, making it ideal for working on the move, but also reduces colour and contrast. Brightness levels are pleasing, but the reflective surface can provide better images for home use. While the 2.7kg chassis is not the smallest or lightest, it is among the sturdiest around and has a high-quality feel. The matt-black plastics used are highly resilient and ably resistant to scratching, making this is a laptop more than tough enough for life on the road. The impressive 195-minute battery life adds to its portable potential. This is a strong result and lets you work on the move or around the home. The chassis also stays cool at all times, so laptop use is always safe and comfortable. Usability is excellent. The keyboard has a five-degree upward angle at each end to provide a more ergonomic typing position. The keys are well mounted and respond smoothly and accurately, making it easy to work for extended periods of time. Despite its limited specification – common at this price – this is one of the better performing machines around. Thanks to the 2.16GHz Intel Celeron processor, basic applications load and run smoothly. This is particularly notable, as the CPU is backed by just 1024MB of memory – a very low allocation even at this price. However, while programs run smoothly when working on one application at a time, the low amount of RAM means the machine struggles when multi-tasking. The 160GB hard drive provides ample storage for basic home or office use, but is bettered by others. The dual-layer DVD rewriter lets you create CDs and DVDs, but there is no native support for memory card formats. Due to its business roots, network connectivity is excellent. 802.11n allows high-speed wireless connections and Gigabit Ethernet delivers the fastest fixed connections. It doesn't feature a built-in webcam, however, which disappoints. With its impressive build quality, usability and connectivity, the Extensa 5230E is a great entry-level business machine. Its lack of features limits its appeal somewhat, but it's still a very well-made and reliable laptop.